Intro: Save our solar system in this full 360° retro inspired arcade action VR game. Protect all planets from alien invaders by controlling drones that are networked into an autonomous defence system. 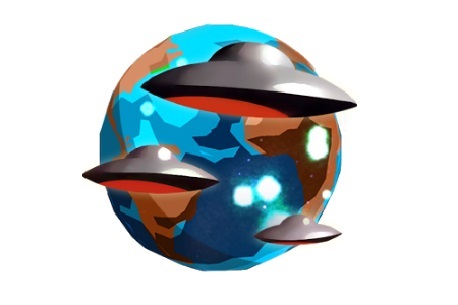 As you progress more planets come under attack, so you’ll have to be wise to outmanoeuvre these cunning extraterrestrials who look to extinguish all life and resources in this galaxy. Verdict: WE COME IN PEACE… is a game for anyone who loves old-school sci-fi films. With crazy sounds and flying saucers, this is not just a game, its a nod to classic sci-fi movies. When it comes to gameplay it can get a bit repetitive very quickly, but if you are willing to work through that you will find plenty of levels to do and replay over and over. It does have to be said this game makes great use of the Daydream controller as the main weapon and it feels oddly responsive which in turn does make the game more immersive. All in all this is no the most amazing space shooter on the Daydream platform, but for £3 it’s well worth a punt.